Our graduates have had a very busy session today building up their finger control using tweezers. 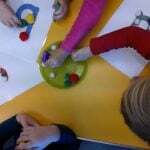 This fun activity helped our little pips to strengthen their pincer and tripod grips in readiness for pencil control. The children giggled their way through a pom pom challenge, working in teams to try and move as many pom poms as possible onto the letter shapes. There were a few stray ones but I think everyone will agree that they did very well. Claire was working with the children as well today and was extremely impressed with their recognition of the a,b,c sounds as well as their hand control. Well done everyone! This entry was posted in homepage and tagged nursery, pincer grip, preschool, school readiness, tripod grip. Bookmark the permalink.